Bright Horizons partners with more than 900 employers to address the family and personal challenges that can impact employee productivity and engagement. Solutions include child care centers, back-up care for children/adults/elders, educational advising for families and adult learners, tuition assistance management, and more. They are proud to partner with more than 80 of the Working Mother 100 Best companies and to have been named 16 times as one of the “100 Best Companies to Work For” by FORTUNE magazine. To learn more, please visit www.brighthorizons.com/solutionsatwork. Bright Horizons wanted to supplement their existing training materials with interactive learning. Their goal was to help their teachers practice skills relevant to their responsibilities without taking too much time away from the classroom. In addition, the learning experience needed to be fun and engaging, both to appeal to their learners and to highlight Bright Horizons’ company culture. 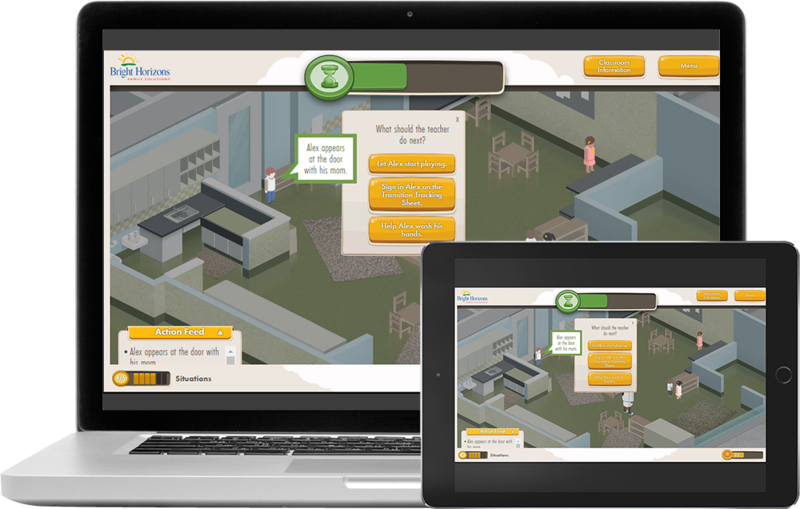 Allen Interactions and Bright Horizons collaborated to develop a 2D interactive game-based e-learning experience for their employees in child care centers. Initial efforts focus on certain skills related to health and safety. The Bright Horizons Virtual Lab School uses game-based mechanics to facilitate learning and problem-solving in a virtual classroom environment. The learner takes on the role of “teacher” to resolve safety-related challenges. The classroom is gamified in that it integrates points, sound effects, a timer, branching scenarios, narrative elements, and game-like aesthetics into the design. These elements activate learners’ intrinsic motivation and approximate the type of decision-making they need when supervising children. These mechanisms also motivate learners to repeat the experience to achieve better performance in the game, which reinforces the information and behaviors they’ve learned. Immediate feedback is provided to learners through narrative, sound effects, and points acquisition. Additional reporting is given to learners at the end of a scenario, in which they can review detailed feedback on each of their choices. Aggregate reporting was not part of the scope of this particular project, but can be incorporated at a future date when additional games are completed. While individual elements such as points, timers and branching scenarios are not necessarily innovative on their own, the integration of these components represents an innovative way to help new teachers practice safety behaviors. Bright Horizons was proud to learn that our Virtual Lab School won Silver at Training magazine's 2016 Online Learning Conference Learning Design Challenge in the Gamification category. Our Education and Development Department created the Virtual Lab School with Allen Interactions so that classroom skills can be practiced in an online game format, uniquely making this learning benefit both safe and fun. The Virtual Lab is one example of how Bright Horizons pursues meaningful innovation to advance our goals that not only ensure that our employees have high quality professional development, but also enhance their ability to provide the best care and education for young children.